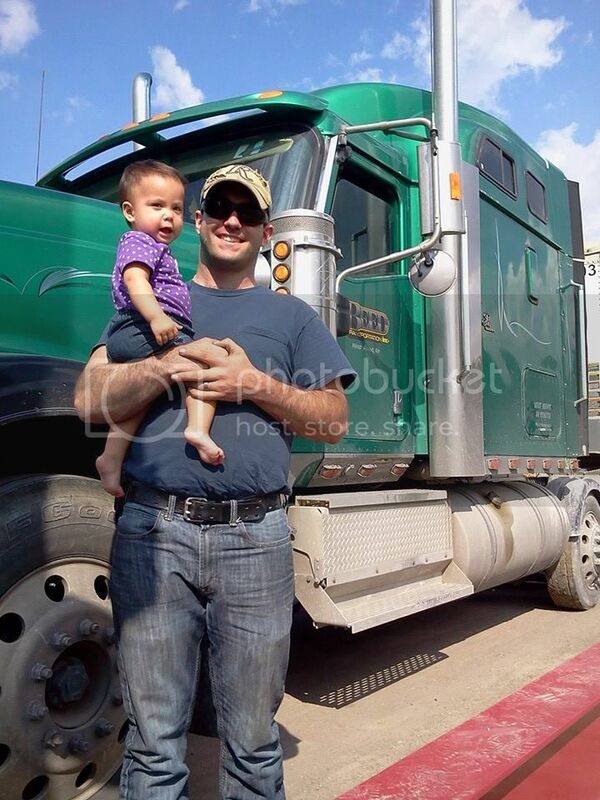 THE PICTURE IS OF MY SON, MY GRANDAUGHER, AND THE TRUCK HE DRIVES... I am a 49 year old mother of 9 and wife of one powerfully good looking man. Love him bunches! Why else would I give him 9 kids??? LoL. Nearly finished raising them, but needing money to put them through school - LOTS OF IT$$$. Only have a high school education. Can't stand offices or meat packing plants. Love the outdoors and LOVE to drive. Since I was a teenager, I've always been a fan of truckers and trucks, but it NEVER occurred to me till just recently that I COULD DRIVE A TRUCK! Wow. What a thought. I've always driven a stick shift from the get - go. First car was a stick and I've haven't changed my mind about my love for the feel of gears yet. Driving automatics is just BORING. I've had to drive a 15 passenger van for the last 15 years, but I haven't driven anything bigger - yet. Can't be all that hard, can it? I've been home-schooling my kids since 1993 and have decided it's time to retire from THAT job. I am NOW a GRANDMA of 3! My husband is self employed and has worked day and night for 29 years to provide for us and I'd like to give him a break so HE can enjoy the kids for awhile before he dies from exhaustion. I've mostly raised them on my own while he has been away working. I'm thinking it might be good to switch things up a bit. I've got cabin fever anyway, and he's all for it, so - why not? You know you want to be a truck driver, when, as a teen, you'd be caught at the local truckstop checking out all the rigs and picking your favorites. You know you want to be a truck driver when your heart beats just a little faster when you imagine YOU are the driver of that big rig that passes by. You know you want to be a truck driver when all your life, gas has been your greatest expense, because driving is the only thing that makes you really feel good when everything else is going wrong. You know you want to be a truck driver when finally, at age 49, somebody says - "You should drive a truck" and for the first time you think - "YES. I REALLY THINK I SHOULD." LET'S DO IT. Today I got my CDL - A permit! I feel like a teenager again! ...brings back memories of when I got my first "4 wheeler's" driver's license when I was 16. What an exciting accomplishment! I am so looking forward to getting trucking experience now...thinking of asking around the farm neighborhood where I live for some experience, but I REALLY want to go to trucking school to get some solid training experience. I am so looking forward to this career. I know it will have it's tough times and stresses like I've read about, but I believe, all in all, I will love it! SO HAPPY! Yippeee!!! Today I passed my general knowledge, my AIR BRAKES and my combination vehicles test!!!! I am now a CDL A permit holder!!!! Wow! I haven't felt this way since I was 16 and got my license to drive a "four wheeler." Now I am just praying to be able to get into Prime - my first choice driving school, or another truck driving school in order to gain experience. I live in the country and was even thinking of asking some of my neighbor friends who have farm trucks if they would let me get some experience with them. Wow! I am so excited! I CAN HARDLY WAIT to drive a TRUCK. May God comfort your heart and give you strength as you keep those home fires a burnin'. Life sometimes asks some hard things of us, but nothing God doesn't give us the wisdom and strength to navigate. Right now, I am considering leaving home for a year to get experience in trucking. I will be leaving behind a wonderful husband who is doing all he can to provide for us and our 6 children, but it's just not enough, so I'm going to do everything I can to close the gap. I'm hoping be accepted at Prime. I applied with them today. I tend to be the pioneer type, but I know it's going to be difficult to be away from my family for quite awhile, but it's the only way we'll be able to afford to put them in Christian school. I can totally sympathize with you but I am totally relying on the strength of my faith to sustain me in this endeavor. I love driving. I love traveling. I've ALWAYS loved trucks and admired truckers for their courage and free spirit and I know that if this is God's will for me, nothing can stop me. He will go with me. He will keep me. I just pray my kids can endure the separation. It will be tough for me too. God be with you and keep you in his care. Well, I'm on page 8 of 16, friend, and this is a real page turner! I am lovin' it! I am so excited to think it could even be possible that I could do what you've done. I'm really enjoying going through The TT Training Modules on this website... And since I've been reading this website and studying for my cdl, this little 4 wheeled driver has gained a much greater respect for truckers and what they go through. I do 80 miles into and out of Omaha daily and I am MUCH more careful of my truck driver friends than I EVER have been in the past. I NEVER pull in front of them anymore! I didn't realize how dangerous it is for ME or THEM. But it's sure making me freak at all the cars I see DOING it. Wow! It's CRAZY. I've also never noticed what good drivers most truckers are! I'm amazed! Thank you SO MUCH for this labor of love. It's really helping me understand what I'm up against when I finally jump in with both feet and DO THIS. I'd just like to say "Thank You!" I am a 49 year old female studying for my CDL. I am so glad I found the truckingtruth.com website. It is very top notch and professional. I enjoy everything about it! I am currently going through your CDL Training/Testing Materials. What a top rate program to get me ready to pass the test for my permit! I enjoy the honesty here while keeping it positive. Any career has its drawbacks and we must be able to take the bad with the good. Personally, I have always LOVED to drive and CANNOT WAIT to be driving full time! I am considering going through a company to be trained, but am also checking out getting trained privately at JTL in Omaha. I live nearby and there are grants offered in the county I live in to pay for the tuition so that's a big plus! Again, thank you for this super website!